A no-nonsense approach to this gentleman’s ranch pays homage to the wide open space of the Wild West. The honest integrity of natural materials is evident in leathered Absolute Black granite counter tops, bronze hardware and hits of copper in wall mounted fixtures. A white porcelain farmhouse sink sits beautifully in custom alder cabinetry. Desert views continue off the new kitchen. 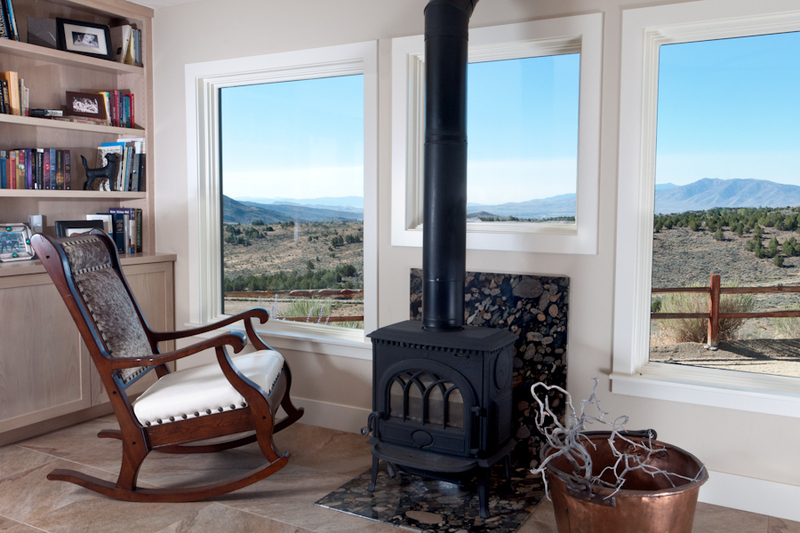 A pellet stove sits atop Black Marinaci granite and offers the perfect spot for a hardy cup of coffee. Custom cabinetry in a tint-finish blends unobtrusively so as not to compete with scenery worthy of Albert Bierstadt. Large scale porcelain tile floors hold up to the daily traffic of cowboy boots, dogs, and good old-fashioned grit; and all with ease.